Through our newssubmit, we recieved an email from Bob Park with a photo and a short story. He had been present at the flyby past Mannlichen, which by now has received quite a lot of attention due to potential actions against such jumps by the town major. For the people present at the event, it must have been an amazing visual though. 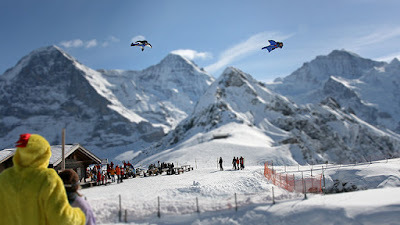 I went up to the Mannlichen with Jokke and also my wife, Denise, the morning of the jump - perfect day with just a gentle breeze -helped the guys get into their suits and watched them leave on the helicopter. You could only just see the helicopter before they jumped against the bright blue sky. My camera autofocus couldn't cope with the small size so the first 2 pics are out of focus. They seemed to travel slowly at first until they got closer and then they went past the lip of the cliff like a rocket!! Jokke shouted - something - but it was lost in the sound of them flashing past. So fast it was over before most people at the bar had time to realize what was happening. I didn't get much of an impression as I was making sure I kept the camera panning with them and working the zoom. This was the second time they jumped over the Mannlichen. That has to be the greatest wingsuit photo I've ever seen. Holy hell!